What springs to mind when you think of corporate catering? For me it is mass made, margarine filled, processed sandwiches, or a buffet of beige food followed by a sleepy afternoon meeting whilst all those carbohydrates you ate at 1pm are burnt up. Having a workforce that eats healthy, nutritious food will help to increase people’s happiness levels, work output and productivity. A 2012 study in Population Health Management found that employees who frequently ate fruits, vegetables and whole grains were 44% more likely to have an increase in productivity than their peers who consumed an unhealthy diet. A difference in diet had more impact on productivity than exercise habits and smoking. Clockwise from top left. Savoury Bacon & Feta Muffins. Basque Chicken. Sandwich Selection. Sweet Potato, Chicken & Chorizo Stuffing Pie. Roasted Butternut Squash Pressed Picnic Sandwich. Catering for a wide array of palates and preferences can be tricky, it is so important to make sure you’re feeding your staff well. With clever menu planning & flavour combinations you can cater for everyone whilst accommodating different tastes and dietary needs. Eating a wide range of colourful foods ensures you are eating a variety of vitamins, minerals and nutrients that will help fuel busy brains. Croquettes – These are great with dips or on their own, they are great finger food and full of flavour. Ideas include Pea and Mint or Carrot and cumin. Sandwich combinations – Offering a different sandwich selection with a variety of fillings can bring so much to your catering. Everyone has eaten a thousand sandwiches in their work life, make yours different! Try beetroot, lancashire cheese & rocket, or Roasted Sweet Potato Paste with Basil & Spinach. Colourful, tasty and unusual combinations that will keep everyone coming back for more. Tartlets – although made with pastry, it is great to have a tasty tartlet topped with Cheese and Seasonal Salad Leaves for a cheeky lunch time treat. Vegetable skewers – Add colour with simple vegetable skewers. I like to marinate courgette in lemon & basil and serve it with red pepper and a green olives. Muffins! Savoury muffins are a great alternative to sandwiches and are full of flavour. I love creating Carrot & Sesame, Bacon, Feta & Pumpkin Seed or Beetroot, Cheddar & Sunflower Seeds. Whatever you decide to feed your staff, make sure it is full of colour and flavour. Clockwise from top left – Goats Cheese & Roasted Vegetable Tart. Roasted Butternut Squash, Brie & Salad Sandwiches. Carrot Cake with Edible Flowers. I love being able to create healthy food to please all tastes and it still being full of flavor and won’t send you to sleep by 3pm. 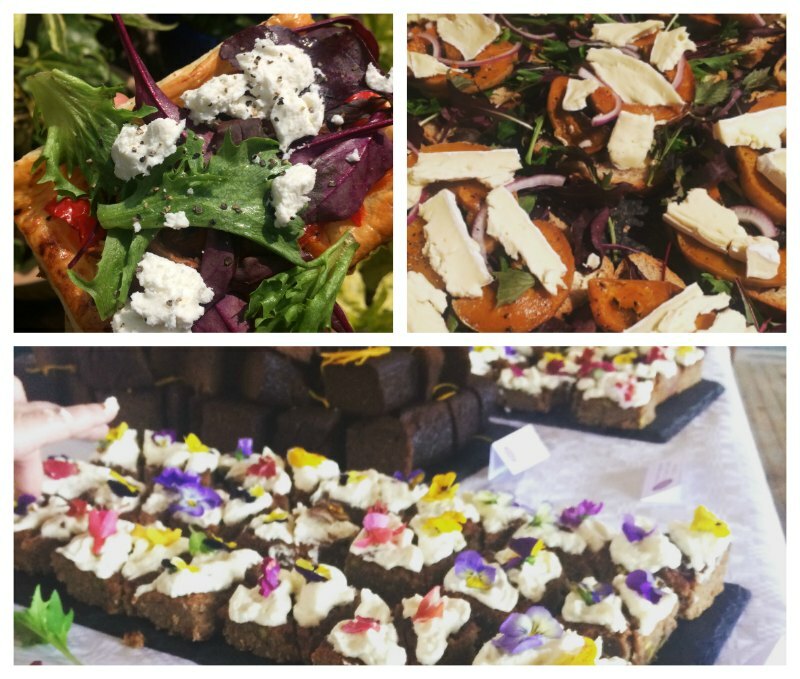 See corporate & business breakfast & lunch menus or get in touch to discuss colourful corporate catering. Want 5% off all of your Corporate & Business Catering? Sign up to Taste the Love’s newsletter today. Se our homepage for more information.